I’m only human and there are times when I think about all the things we sold and how nice it would be to have this or that. There are times when the boys reminisce about toys that they don’t have any more, especially when they look at pictures from their past. Denise gave the boys many superhero costumes a few years ago. The boys loved them and there are many pictures of all the boys dressed up ready to save the world. Today a new colleague of mine with two older boys asked if I would want our boys to receive a bag of superhero costumes. I said, “yes!” and she gave me the bag. This afternoon our boys and our neighbors boys had fun dressing up as superheroes and saving our compound from destruction. I’m reminded again of how awesome our God is that he even cares about the smallest details. 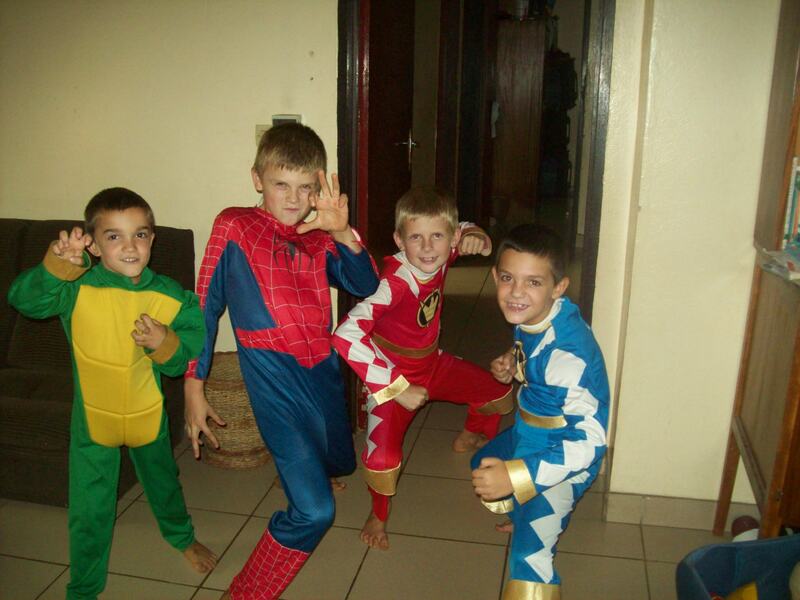 This entry was posted in Cameroon, home, Kids and tagged Cameroon, Superheroes. Bookmark the permalink. How great is God. How big the boys are getting! He knows just what to send at just the right time!